It doesn’t matter how carefully I plan, it seems I always have leftover spaghetti. I don’t really like to reheat and eat spaghetti. It just loses something. The noodles get too soggy or they get completely dried out. It’s just never a happy thing for me. 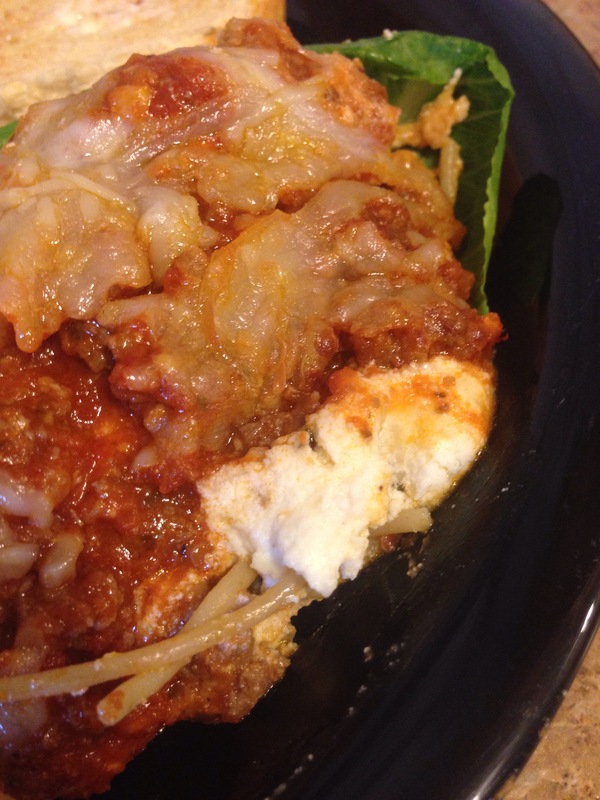 But, if you layer those noodles and sauce with some ricotta and mozzarella and bake it, you have all the deliciousness of lasagna, with the ease and resourcefulness of leftovers! First, stir together ricotta, mozzarella and Parmesan cheeses with a little black pepper and Italian seasoning. Then, lay your leftover spaghetti noodles evenly in the bottom of your pan. Top the noodles with the cheese mixture. Top that with your leftover sauce. Sprinkle with a little extra cheese. 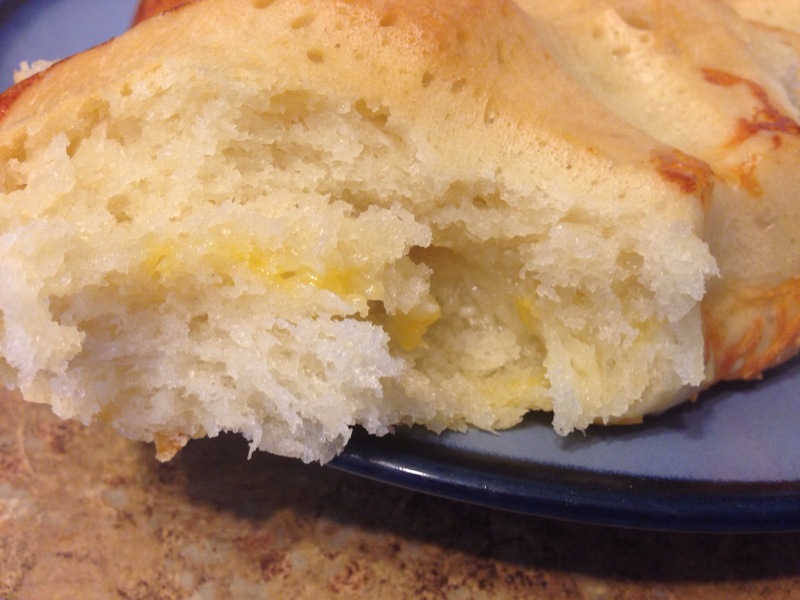 Bake until cheese is melted and sauce is bubbly. I served mine on top of a couple crisp leaves of romaine lettuce. Stir together ricotta cheese, 1 cup mozzarella cheese, Parmesan cheese, black pepper and Italian seasoning. Layer cooked spaghetti noodles evenly in the bottom of a small baking pan (I used a 9″ round cake pan). Spread cheese mixture evenly over noodles. Top with leftover spaghetti sauce. Sprinkle with remaining mozzarella cheese. Bake at 350* for 20-25 minutes, or until cheese is melted and sauce is bubbly. If you grew up anywhere even remotely near the South, chances are you’ve had a generous amount of broccoli cheese casserole. It’s ok, but I just really don’t care for those canned, condensed soups. My husband, however, LOVES this casserole. Our compromise? I make it with leftover, homemade broccoli cheese soup. I’ve seen this served as a side or even with whole chicken breasts or thighs roasted on top of the casserole so it makes a one dish meal. I like to do it that way, but this time of year is lean for us. My husband works in the oilfield. Seems these companies always underestimate their yearly operating expenses and work gets cut to the bare minimum toward the end on the year. This recipe uses up your leftovers, stretches a little bit of meat and makes a hearty meal that is a crowd pleaser. Oh, and did I mention it is seriously easy? Cube up one large or two small chicken breasts. 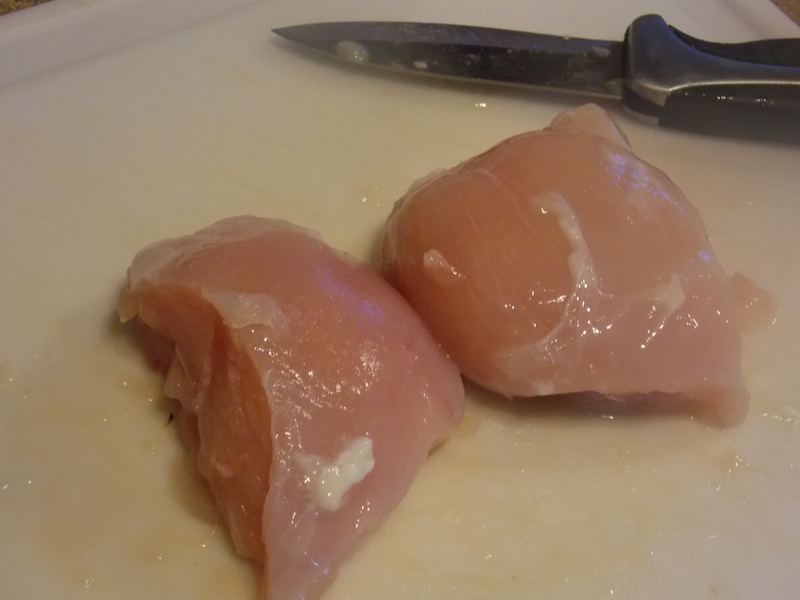 Seriously, I hate that when I buy frozen chicken breasts there are always a couple of monster pieces and then some that are so small it is obvious they aren’t whole breasts. I use those for this. Here is the chicken I started with. It made about a cup and a half of cooked cubes. That is seriously all the chicken I used. After your chicken is cooked, add equal parts prepared brown rice (or you could use half as much uncooked minute rice) and leftover broccoli cheese soup (or, if you prefer, used condensed soup and some milk) to the pan with your chicken. 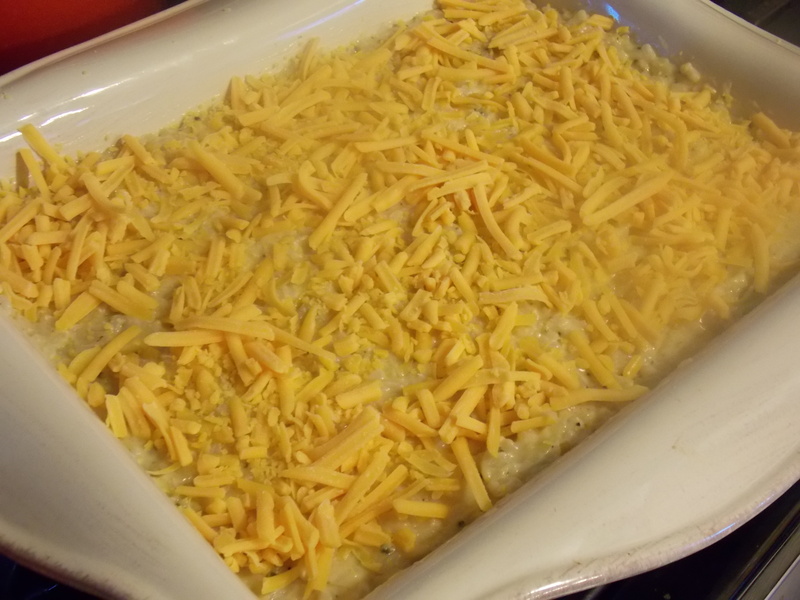 Pour the whole mixture into a large casserole dish (9×13), and sprinkle with cheese. 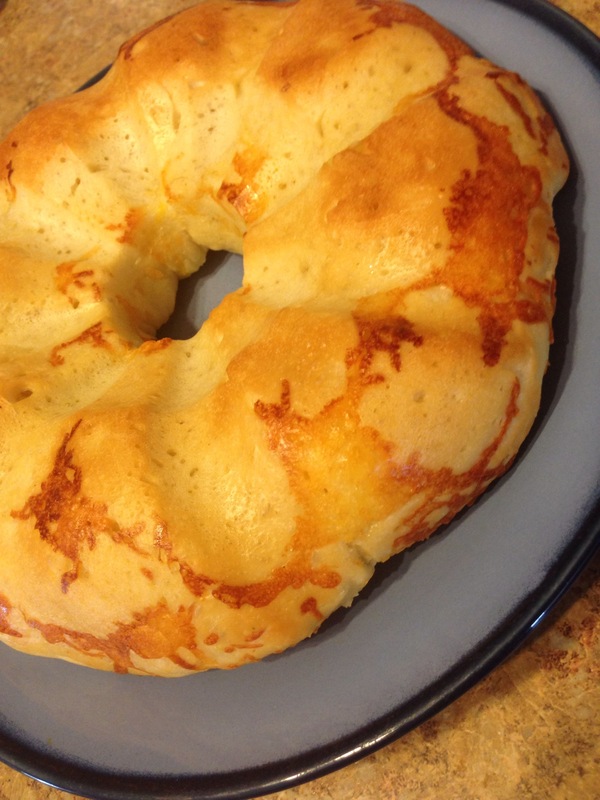 Bake until the cheese is melted and the edges are bubbly. It doesn’t take long since everything is cooked through already (you may have to cook it longer if you use uncooked rice). Serve wit ha nice salad and you’ve got a full meal. Heat oil in large skillet. Sprinkle chicken with salt and pepper. Brown chicken in skillet and remove from heat. 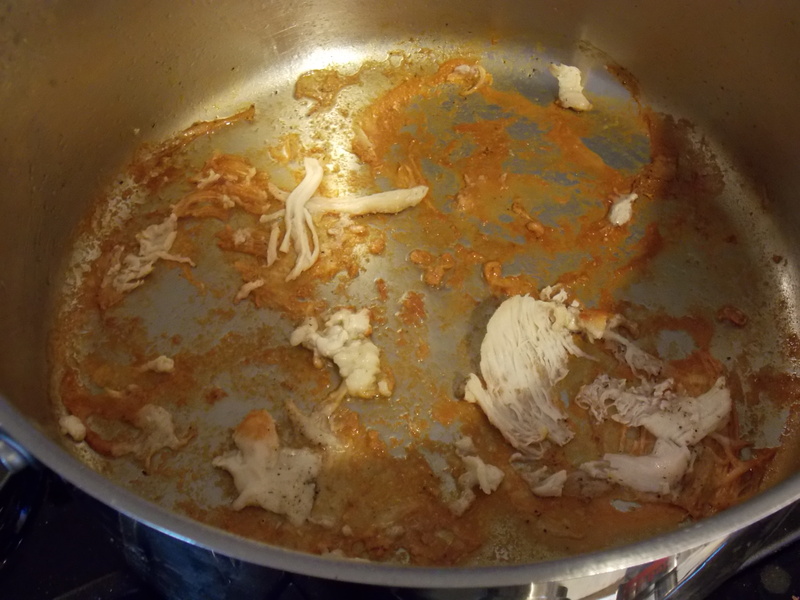 Stir in leftover soup and loosen any brown bits that remain from cooking the chicken. Stir in rice. 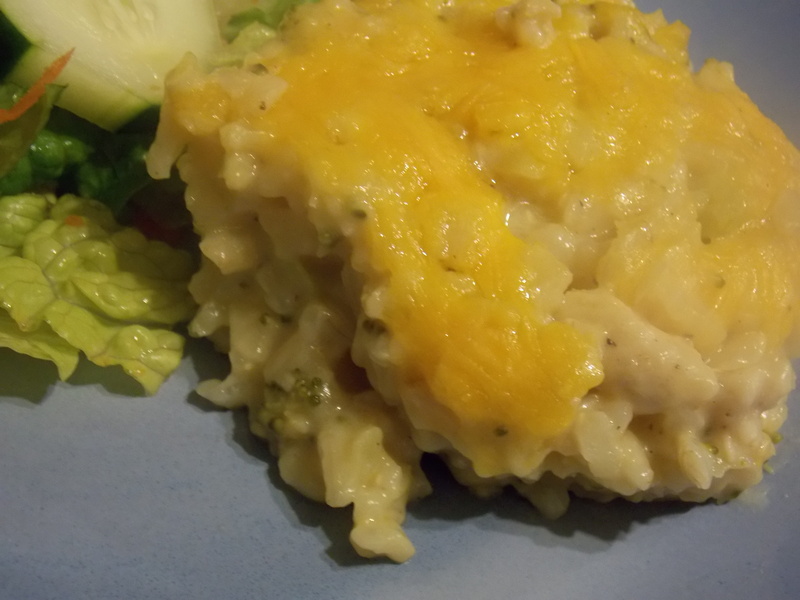 Transfer the meat, soup and rice mixture to a 9×13 casserole dish and sprinkle with shredded cheese. Bake at 350* for 15-20 minutes. Let stand for 5 minutes before serving. I bet you thought I had disappeared. Not really. I did, however, prepare a full Thanksgiving dinner for my daughter’s class, start (and finish) my Christmas shopping and spend a full week at my parents’ mountain home sans internet. I’m back home now, and things are crazy. The peace of the holiday season won’t hit here until the morning of December 26. I’ll be sharing lots of recipes for goodies as I make them, but I’ll be sure to include some dinners too. Maybe you’re already done with turkey leftovers, maybe you’re not. If you fall into the earlier category, you can make this with chicken just as easily. If you fall into the latter category, this is a good way to use up the last of several different things. 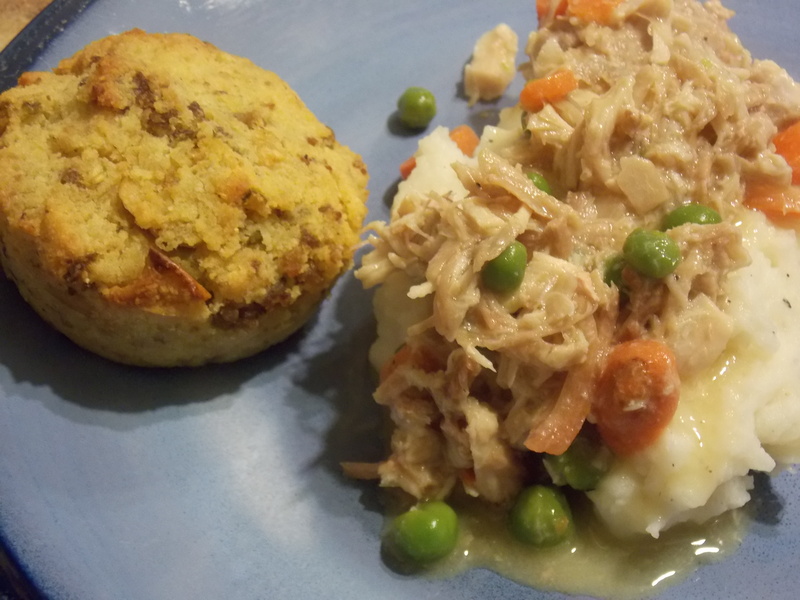 I use leftover turkey, gravy, vegetables, mashed potatoes and stuffing to make this meal. Start by dicing up any leftover turkey you have. Heat up a skillet and add diced turkey, gravy and vegetables. You should probably drain the vegetables or it will thin your gravy out. If you need additional liquid, go ahead and use the liquid from the veggies, you may just have to thicken it with a little flour and butter. I used peas and carrots because they are what I had. Almost any vegetable will work well in this recipe. Let this simmer. In the meantime, take your leftover dressing and add two eggs to it. Mix everything together well. It should make a tight dough. 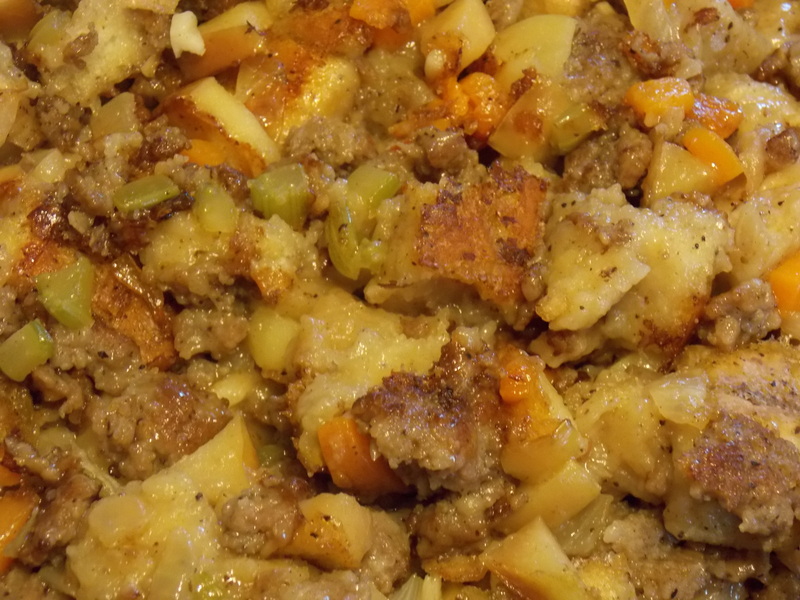 I used cornbread dressing with sausage and apples, but it should work with any dressing. Scoop a generous portion of dressing and press into muffin cups. I used 4 cups of dressing and 2 eggs and made 8 muffins. Bake these at 350* for 20-30 minutes or until tops are golden brown and crispy. Just before your muffins are done, reheat your mashed potatoes. You may need to add a little butter or milk to get them the right consistency. Just be sure you add liquid slowly since they will loosen a bit when they are warm. Serve a scoop of mashed potatoes, top with the turkey vegetable gravy and put a muffin on the side. Hearty and simple. 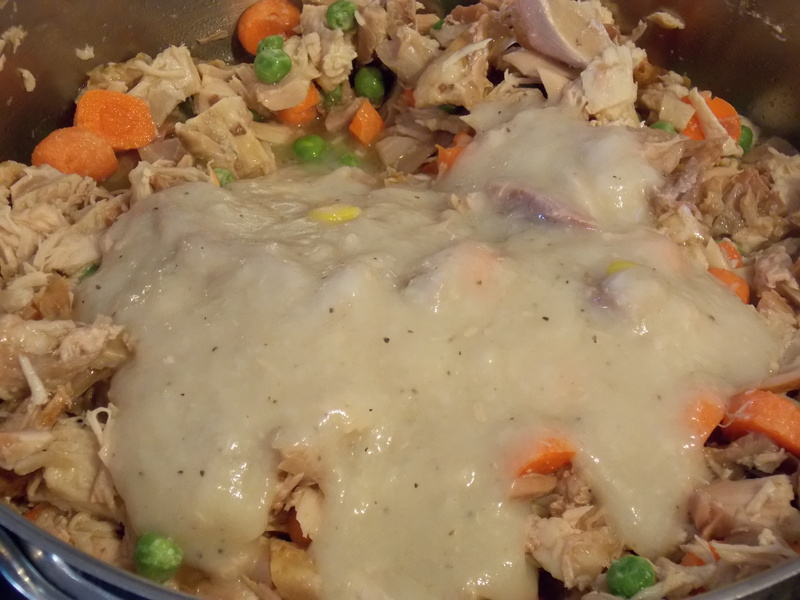 Combine turkey, peas, carrots and gravy in a large skillet. Simmer over medium heat until everything is warmed through. Reheat mashed potatoes, adding more milk or butter if necessary. Serve turkey and vegetable gravy over mashed potatoes. Preheat oven to 350*. Grease muffin tin. Mix together dressing and eggs until completely combined. You should get a stiff dough. 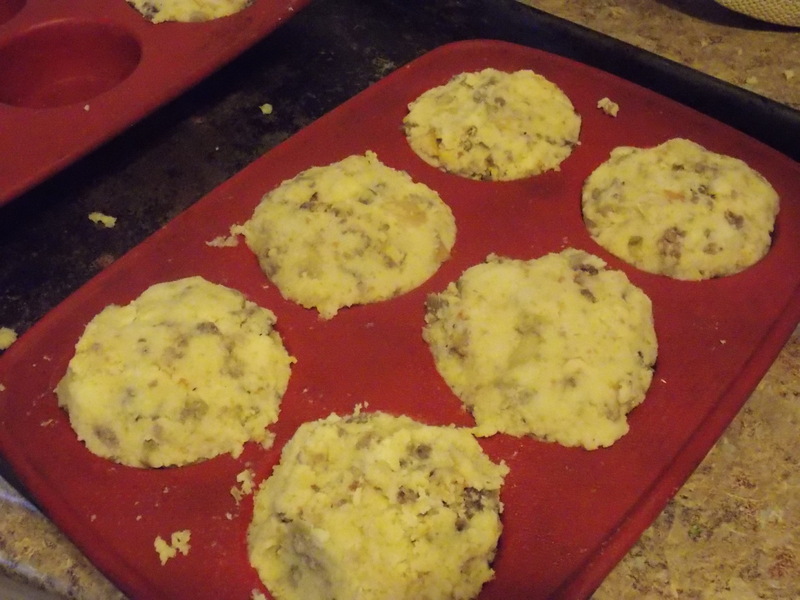 Scoop dough into greased muffin tin. Bake 20-30 minutes or until golden brown and crispy. Halloween and fall Box Tops submissions kept me way busier than I planned last week. Postings this week will be much more consistent. Thanks for your patience. Remember when we roasted that Acorn Squash and I promised to share how I use the leftovers? Well, it took longer than a week. In fact, it’s been almost 2 weeks since I shared that recipe. Better late than never. Take your leftover squash, remove the skins and put it in the blender with some cumin, chile powder, cinnamon, salt and water. Puree until smooth and creamy. 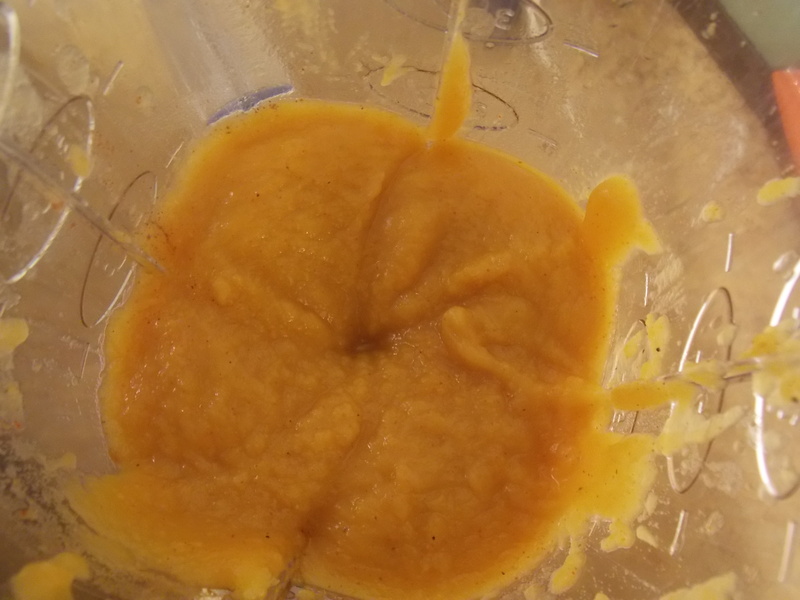 Now, I’m sure you could eat this puree just like this, but why do that when you can make it even more delicious. 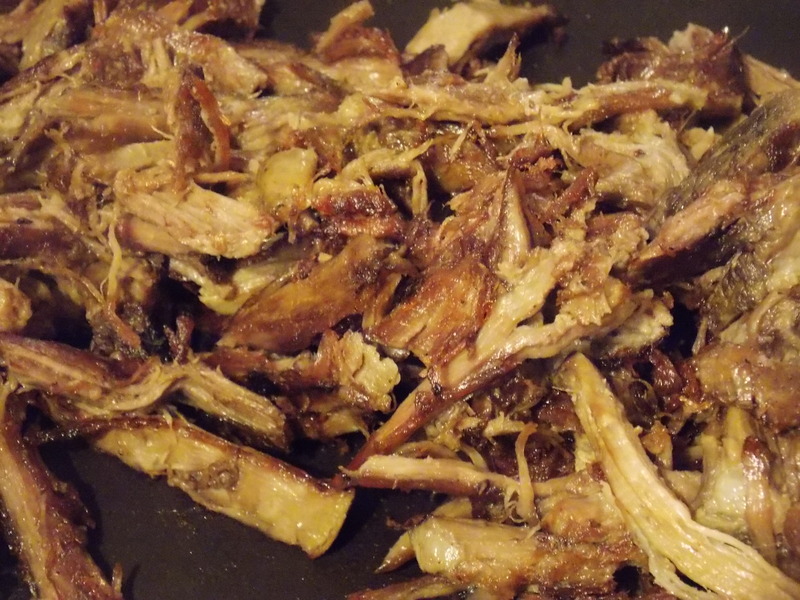 If you’ve got some leftover roasted meat (pork, beef or chicken will all work just fine), shred it up and put it in a skillet with hot oil. Fry until the edges are crispy and golden (this is beef, in case you’re wondering). 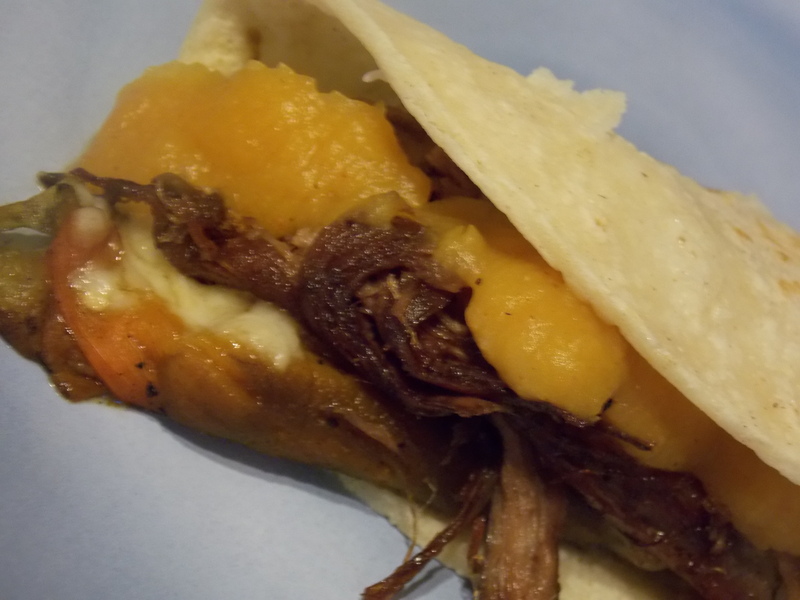 Then, layer some meat, sauce and cheese (or cheese stuffed green chile) on a steamed corn tortilla and enjoy a fantastic fall taco. Remove skin from acorn squash and discard. Place squash, cumin, chile powder, cinnamon, salt and water in blender. Puree until smooth. Use as a side dish, a sauce, a thickener in soups or as a topping for tacos. Remember when we made Green Chile Chicken Enchiladas and I told you to freeze that extra sauce? Well, this recipe is why. It is perfect for a rainy day. Especially one where you have limited time. You can make it even faster by using leftover chicken or pork chops. I didn’t have any leftover, so I started with a pound of uncooked chicken breast. If you have time, I really recommend this because you get the extra flavor from cooking the chicken in your soup pan. 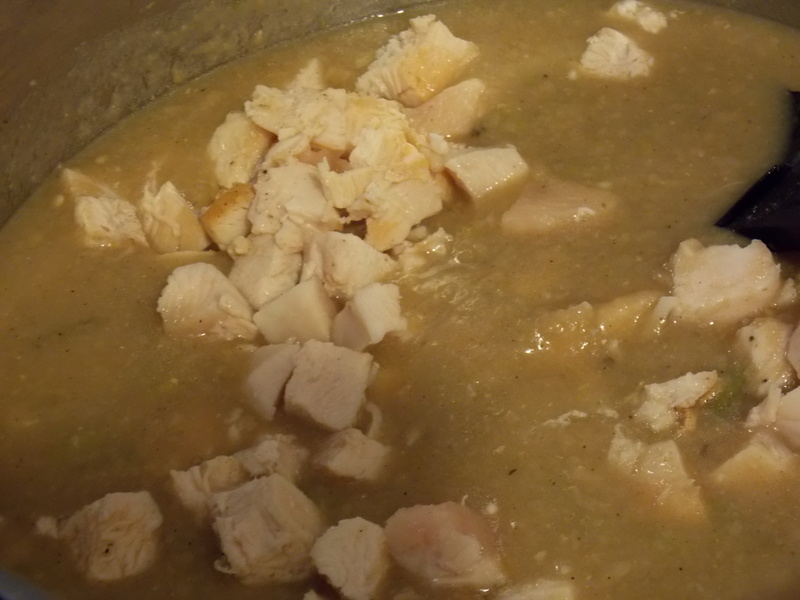 If you’re using leftover chicken, I recommend swapping out the water in this recipe for broth. So, start by heating some oil in the bottom of a big soup pot. Sprinkle both sides of your chicken with salt and pepper. When the pan is hot, add the chicken. Let it cook for about 5 minutes on each side. The chicken will be brown on the outside. It might not be cooked through, that’s ok, it will finish cooking in the soup later. You see all that brown in the bottom of the pan? That’s flavor right there. Add about 2 cups of water to the hot pan. As the water heats, those brown and stuck bits will loosen up. When you’ve got most everything pulled up from the bottom of the pan, add 4 cups of leftover green chile sauce. Turn the heat down to low and let that simmer away (or thaw if you added it frozen like I did). Dice your chicken and add it to the pot. Wash, peel and dice your potatoes. Try to get the potato chunks about the same size as the chicken chunks. Add potatoes to the soup. If it seems too thick to you, add some water. I added about another cup of water to mine. Simmer over low heat for 20-30 minutes or until the potatoes are done. Taste for seasoning. You’re probably going to need to add a little salt since potatoes absorb a lot of salt flavor. 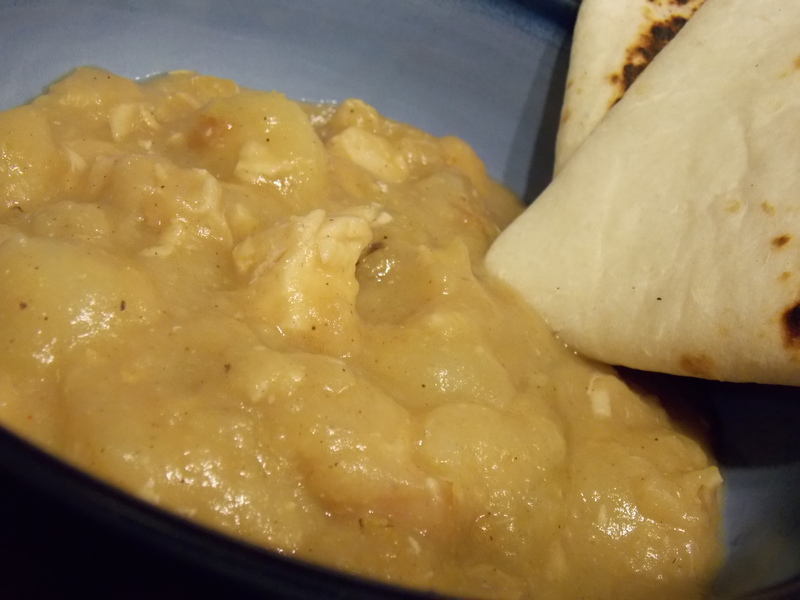 When you’re happy, warm up some flour tortillas and ladle out bowlfuls of this hearty stew. Heat oil over medium high heat in a large soup pot. Sprinkle both sides of your chicken (or pork) with salt and pepper. Place chicken in hot pan and brown on both sides (approximately 5 minutes per side). You don’t have to cook the chicken through, but it is ok if you do too. Remove chicken from pan and set aside. Add 2 cups water to pan and stir to loosen all the brown bits in the bottom of the pan. Add green chile sauce and reduce heat to low. Cube chicken and add to pot. Wash, peel and dice potatoes. Add to pot. 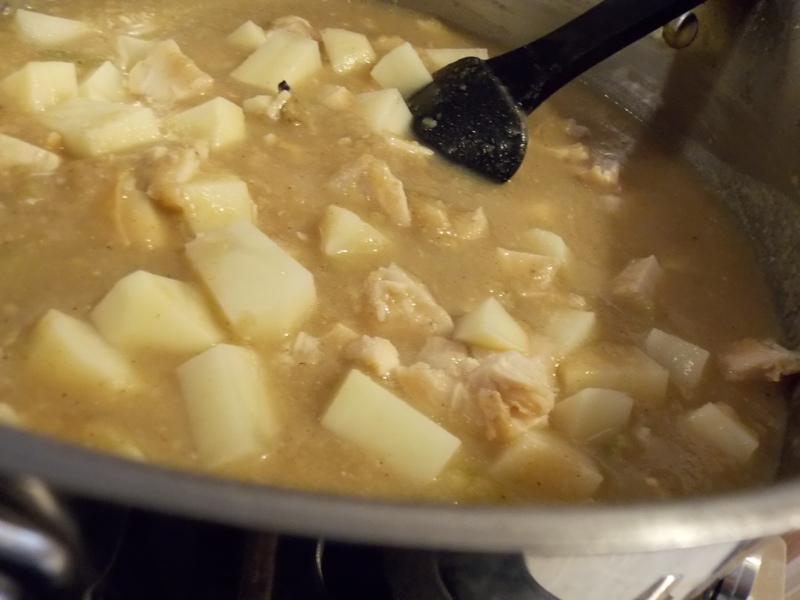 Simmer for 20-30 minutes or until potatoes are tender. Add more salt if necessary. Serve with warm flour tortillas and desired toppings (cheese, onion, tomatoes, sour cream – really, whatever sounds good to you). Yeah, I said it. 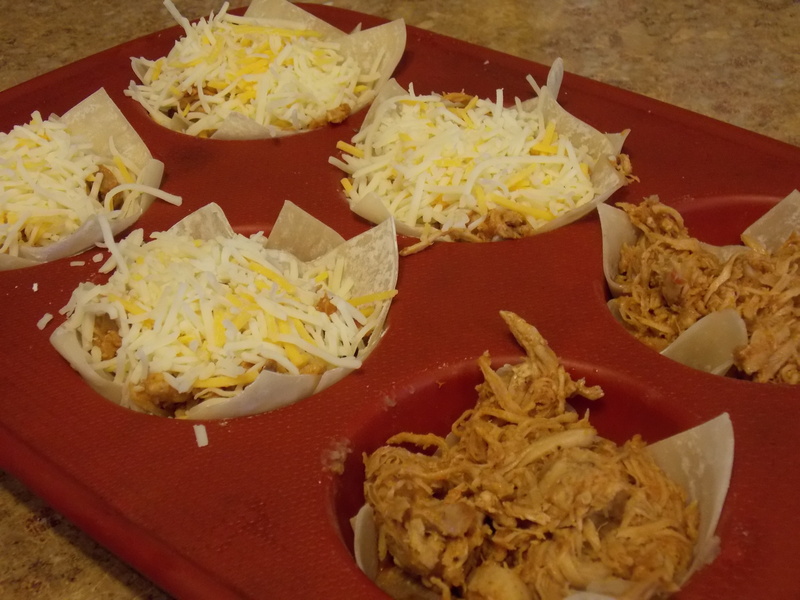 Taco Cupcakes. They only resemble a cupcake in shape and size, so don’t gross yourself out thinking about sugary sweet tacos with frosting (ick! ).My kids LOVE these. First, they’re called cupcakes. Second, they’re just the right size for little hands. Third, you don’t have to worry about the shells snapping in half or having your filling leak out the back. Also, they travel well in lunch boxes. Sometimes, I mix up fresh taco filling just for these, but more often I use whatever taco filling we have left and make these for lunch. Spray your muffin pan if it’s not the silicone variety. Press a won ton wrapper into each hole. Spoon a spoonful of refried beans onto the won ton. Top beans with cheese and a second won ton skin. Top that won ton skin with taco meat (I used leftover chicken) and more cheese. You’ll see some in the picture with only one layer. My picky kiddo doesn’t like cheese on his meat. Those are his. Just won ton skin, beans and taco meat. Pop these in a 350* oven for 10-15 minutes or until the cheese is melted and golden. Let them cool for a couple of minutes before serving. Preheat oven to 350*. Spray muffin pan with cooking spray. Line 6 muffin cups with a won ton skin. 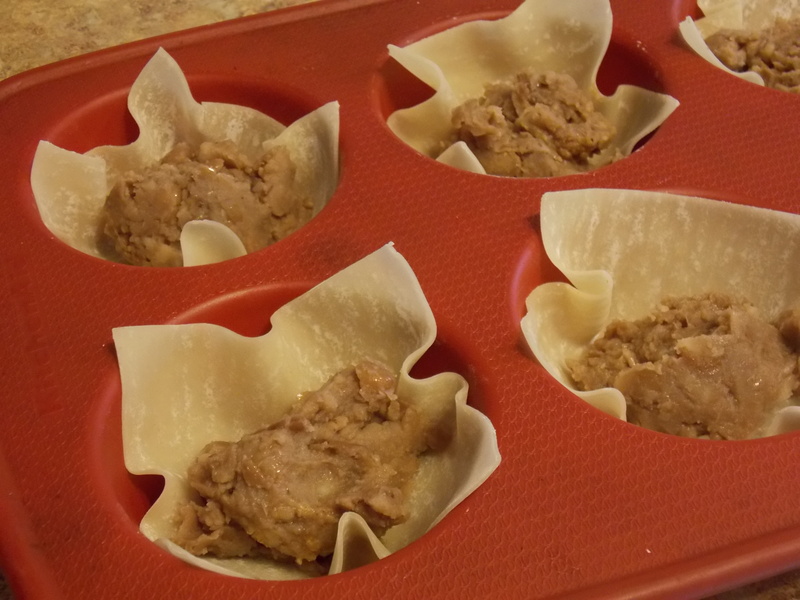 Place a heaping tablespoon of refried beans on top of each won ton skin. Top beans with half the cheese. Place a second won ton skin in each muffin cup and press down gently to spread beans and cheese evenly over the bottom of the muffin cup. Top this second skin with taco meat (about 2 Tablespoons). Top meat with remaining cheese. Bake at 350* for 10-12 minutes or until cheese is melted and won ton edges are brown and crispy. Let stand for 2-3 minutes before serving. I have several great recipes saved up to share with you from my weekend “off”. I was looking through pictures and couldn’t decide what to share. Everything looked so delicious. Then, I remembered a friend of mine suggesting that I do More Than Microwaving on Mondays. 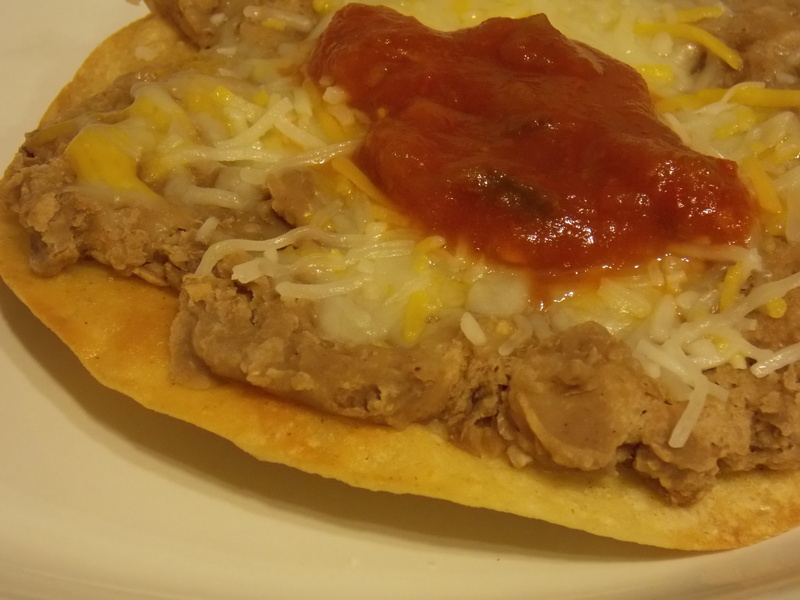 Refried beans are a staple in New Mexican cuisine. I used to open a can and plop the mushy contents into a pan and reheat. Then, I got pregnant with my first child. Suddenly, everything that came out of a can, tasted exactly like the can it came out of. I could doctor them some and help temper that metallic flavor, but I finally gave up and just started making my own. You can start with dry beans, but if you’ve got some already cooked up, it makes this process even more simple. Just realize that your refried beans will have the flavor of your original beans, so bbq beans or baked beans aren’t recommended. Chile beans are perfect (even if they’ve got a little meat in them). Start by putting the beans in a pan to warm them up. If your beans aren’t nice and soft, use this time to cook them a little longer. You want them to be really soft and not very soupy. You can tell I cooked quite a bit of liquid off of these. When the beans are soft, add 1/2 teaspoon cumin and mash with a potato masher. If you want them super smooth, I suppose you could use a food processor, but I like a little texture in my refried beans. 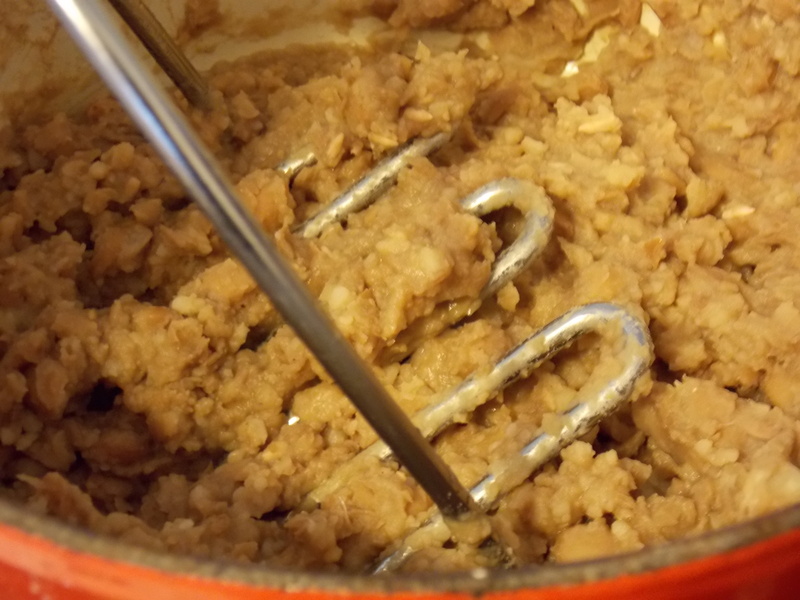 As you mash, the beans will start to absorb all the cooking liquid. To keep them nice and moist, you need to add some fat. Lard is traditional. Bacon grease is fabulous, but butter will work just fine too. Serve these alongside your favorite Mexican meal. Top them with cheese if you want. Or, put them on top of a tostada with a little cheese and salsa and they become a meal all their own. 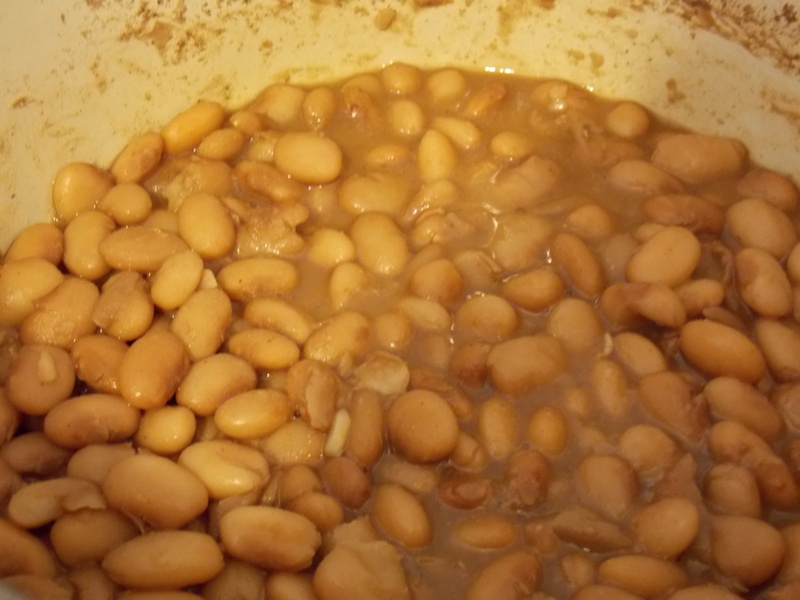 Reheat beans and cook until beans are very soft and the liquid level and bean levels are about equal. You can add more water and cook the beans longer if you need to. When beans are soft, add cumin and mash with a potato masher. Mash until desired consistency and stir in fat. Serve warm. *Lard, bacon drippings, butter or margarine all would work fine. Remember those rolls I made yesterday? The ones you just stir up and toss in the fridge until you’re ready to bake them? The ones that taste so good I almost ate the whole dozen myself? You do? Good. Now, do you remember I only baked 12 rolls but said the recipe would make 24? That’s because I was saving some for this loaf of bread in all its cheesy goodness. Scoop about half your remaining dough in little dollops into a greased bundt pan (or bread pan, I just like the way it looks). Sprinkle 1/4-1/2 cup shredded cheese over the dollops. 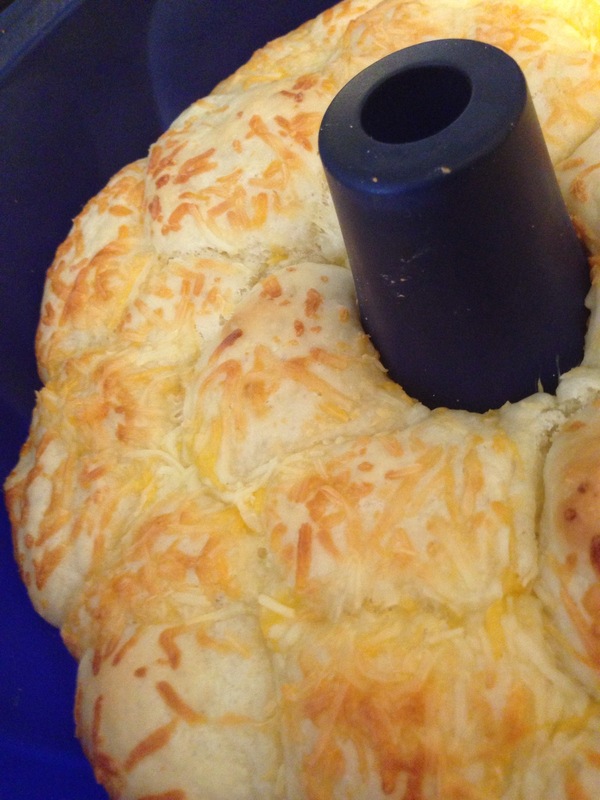 Top with remaining dough and more cheese. Bake until the bread is done and the cheese is golden. Preheat oven to 350*. Grease a bundt pan. Use about half your dough to scoop little pieces into the greased bundt pan. Be sure to cover the bottom on the pan. Sprinkle half your cheese over the dough. Use the remaining dough to scoop little pieces onto the top of the dough and cheese already in the pan. Sprinkle with remaining cheese. Bake at 350* for 30-35 minutes or until golden brown. Allow to cool for 10 minutes and then invert bundt pan onto serving plate. Slice (or tear) to serve. The other day, I shared my recipe for Honey Cracked Black Pepper French Bread. Two loaves of French bread doesn’t seem like much, but we never seem to eat it before it starts to mold – especially not in the summer. I suppose I could freeze half and have bread another day, but why do that when I can take the leftover bread and make this dressing to serve up with grilled chicken or pork chops? The best part, I do it in a skillet, on the stove top. That’s right, no oven. I start by cutting a half a loaf of leftover French bread into half inch cubes and letting it sit out to dry a bit. 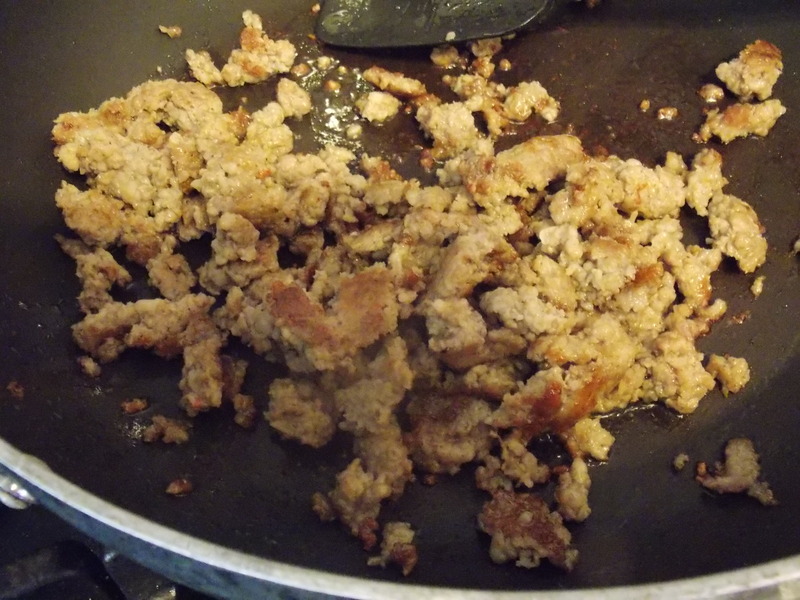 Then, I heat up my no stick skillet and toss in a half a roll of breakfast sausage. You could use Italian sausage if you prefer. Just be sure you let it get nice and brown.. 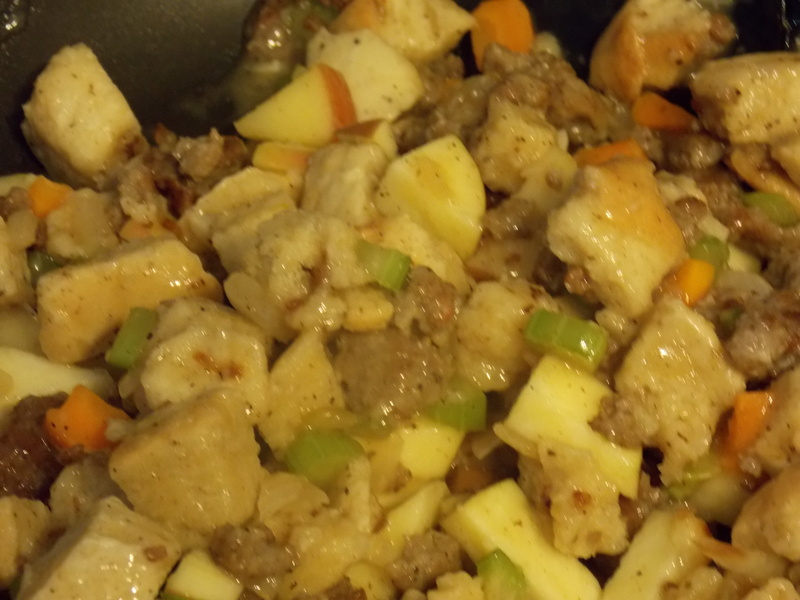 While the sausage is browning, dice up some onion, celery, carrots and apple. Add them to the pan and cook until the veggies soften. 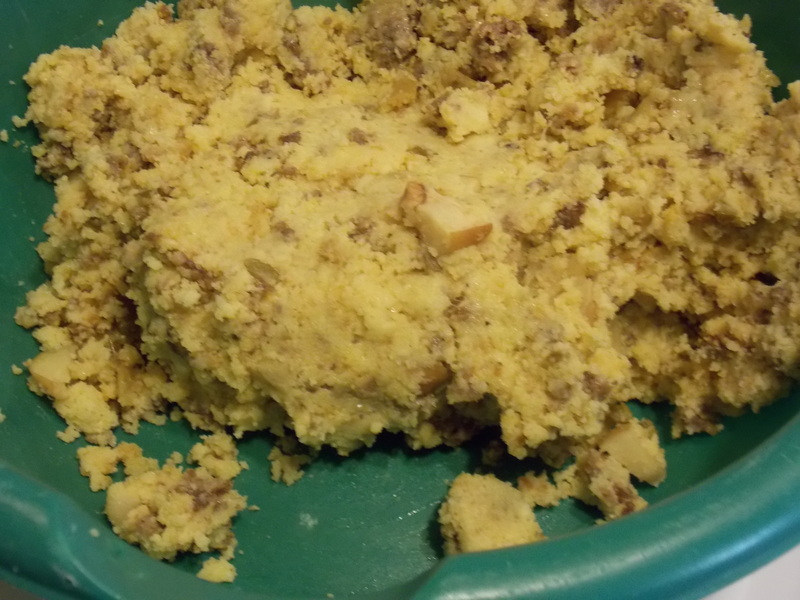 My ex-husband’s grandmother made the best cornbread dressing. She always added apples. Her other secret? Don’t moisten the bread with stock – use gravy. I mean, really, what isn’t better with gravy? 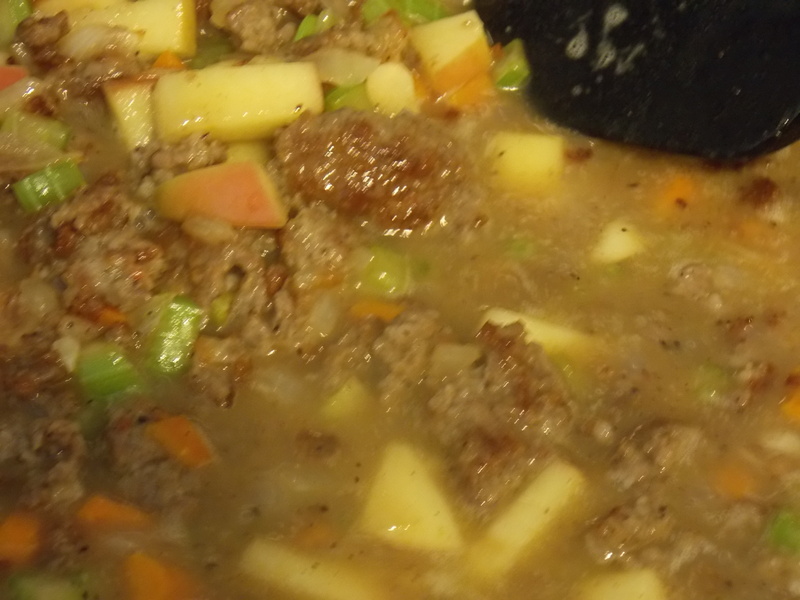 So, add some flour to your sausage and veggies and apples and let it cook a little. Then add some stock and let it thicken. Beautiful, right? Toss in your bread cubes and give it all a good stir. Cook it until it dries up a bit and is warm and delicious. If you want a crispy crust, pour your gravy mixture over your bread, wipe out the pan and heat up a little butter or oil in the bottom of the pan before you add the bread and gravy back in. Let it cook until your nose tells you it is ready. I was hungry, so I didn’t let mine get as brown as I could have. It was delicious anyway, and even had a few brown, crispy bits. Heat a large non-stick skillet and add sausage. Cook until brown, making sure to crumble it well as it cooks. DIce onion, carrot, celery and apple. 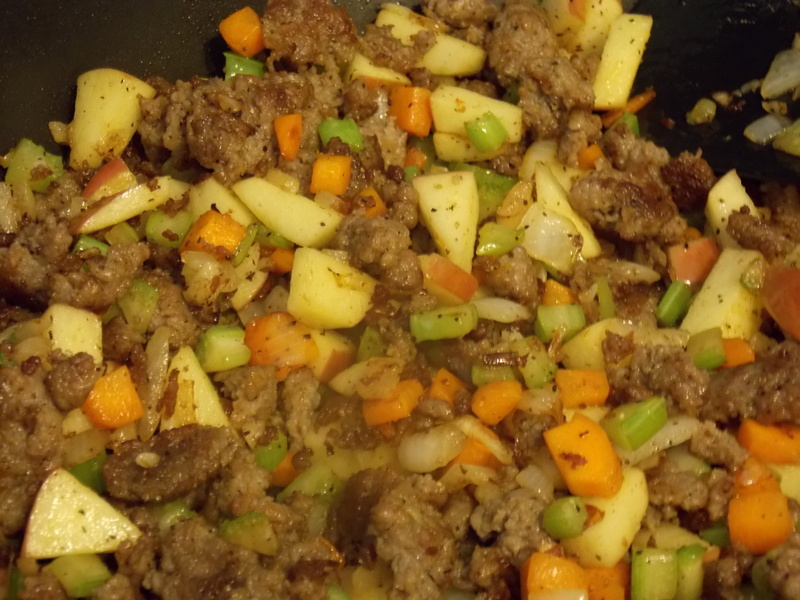 When sausage is almost cooked, add vegetables and apple. Continue cooking until vegetables soften a bit. Sprinkle flour over the sausage mixture and cook for about a minute. Add 2 cups stock. Cook and stir until thickened and bubbly. Taste gravy and add salt to your preference. Add cubed bread and stir to coat. Cook over medium heat without stirring until dressing dries up a bit and you can smell it browning. Serve hot.